About 25 different paintings are hung in the spacious gallery space. Not one repeat from the last show. This exhibit offers a fresh look at Hennessey’s production from the past 50 years. He came to Baltimore in 1966 to teach at the Maryland Institute, where he was a member of the painting department for 37 years. A career-spanning exhibition by the MICA emeritus faculty member, focusing on work produced in Baltimore from 1965 to the present day. Reception: Thursday, Feb. 15, 5 – 7 p.m.
James J. Hennessey earned his undergraduate degree at Illinois Wesleyan University and a graduate degree at the University of Colorado, Boulder, where he studied with Richard Diebenkorn, Wendell Black, and Roland Reiss. Hennessey’s first teaching position was at the University of Illinois at Champaign-Urbana, where he was hired in 1960. In 1962, one of Hennessey’s paintings was included in the Museum of Modern Art’s (MOMA) exhibition, “Recent Painting U.S.A., The Figure”. The show was a juried exhibit that subsequently toured the country after the New York opening. In the same year, the American Academy in Rome, Italy awarded Hennessey “The Rome Prize”. As a result, he was in residence for two years in Rome and exhibited in several galleries both in Rome and Milan. In 1965 Hennessey joined the faculty of MICA, where he taught until he retired in 2002. During this time he accrued an extensive exhibition record with works shown in New York at the Marilyn Pearl Gallery, the Boris Mirski and Alpha Galleries in Boston, and at the Pensler Galleries in Washington, DC, among others. 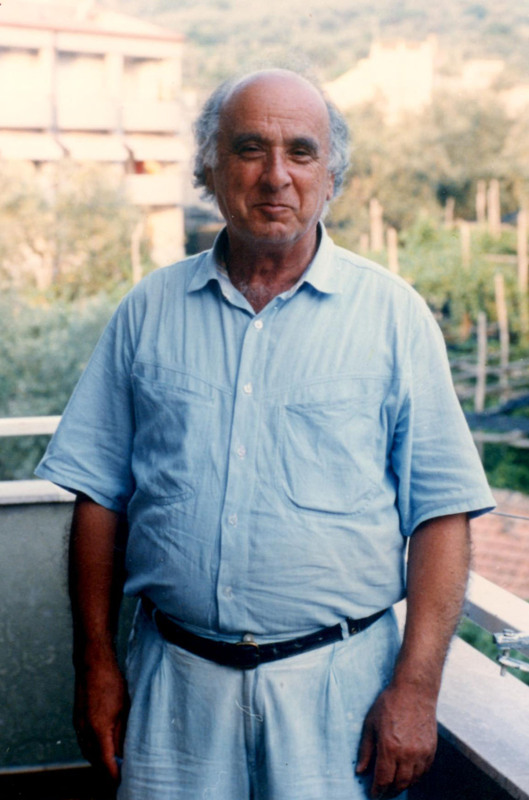 He directed programs for students, faculty, and professional artists in Italy and France, including the MICA Italian Program in Sorrento, Italy, and the Alfred and Trafford Klots Residency Program in Rochefort-en-Terre, France. His paintings continue to be fueled by his extensive European experiences. James Hennessey maintains an active studio in downtown Baltimore, Maryland. When artist James Hennessey moved to Baltimore in 1965 to teach painting at the Maryland Institute College of Art (MICA), he never anticipated the influence he would have on thousands of young painters who took his classes until 2002. Beyond his impressive career as a teacher, Hennessey’s success as a painter has seen his signature soft palate aesthetic and subtle depictions of mythological fables exhibited across the globe. Enduring Concerns focuses on Hennessey’s large paintings and celebrates more than 50 years of his work in Baltimore. James Hennessey is a painter’s painter: his daily studio practice finds him methodically working his large canvases, adding and subtracting inflections of color and light, scraping and sanding away excess, and repeating as necessary to achieve his thoughtful surfaces. While his subject matter varies slightly between series, he concentrates on landscapes, interior spaces, figures, light, and atmosphere in his carefully constructed compositions. Hennessey paces himself when creating work, sometimes taking months to complete a single painting, and generally working on only one painting at a time. The exhibition’s title, Enduring Concerns, references his steadfast consistency, and intense focus on a small number of subjects. According to Hennessey, “my work is episodic – there are clusters of paintings that fall into categories, such as ‘Windows’, ‘Irish Paintings’, ‘Italian Paintings’, and ‘Furniture’, among others.” All episodes of the artist’s illustrious time in Baltimore will be represented in this rare survey. In 1962, one of Hennessey’s paintings was included in the Museum of Modern Art’s exhibition, “Recent Painting U.S.A., The Figure”. The show was a juried exhibit that subsequently toured the country after the New York opening. In the same year, the American Academy in Rome, Italy awarded Hennessey “The Rome Prize”. As a result, he was in residence for two years in Rome and exhibited in several galleries both in Rome and Milan. In 1965 Hennessey joined the faculty of MICA, where he taught until he retired in 2002. During this time he accrued an extensive exhibition record with works shown in New York at the Marilyn Pearl Gallery, the Boris Mirski and Alpha Galleries in Boston, and at the Pensler Galleries in Washington, DC, to name a few. 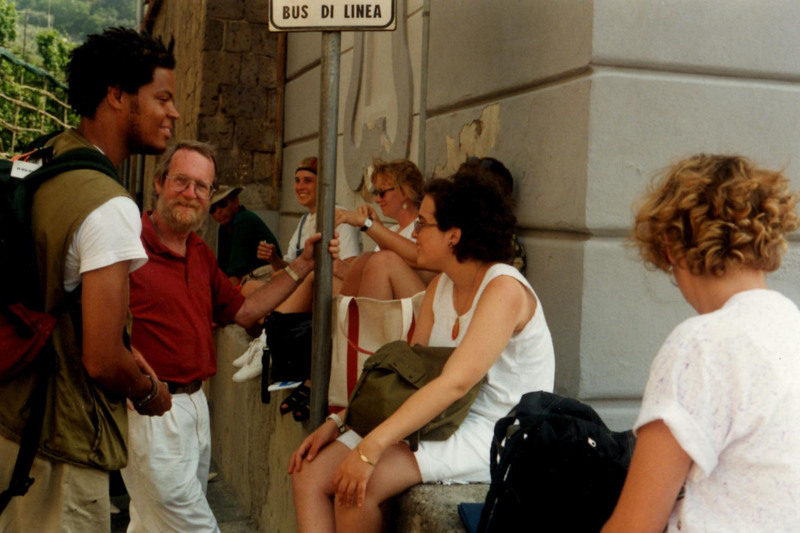 He directed programs for students, faculty, and professional artists in Italy and France, including the MICA Italian Program in Sorrento, Italy, and the Alfred and Trafford Klots Residency Program in Rochefort-en-Terre, France. His paintings continue to be fueled by his extensive European experiences. For nearly a decade the painter Jim Hennessey was the director of a summer painting program in Southern Italy. He and his wife, Dr. Pamela Potter-Hennessey, were the artist and the art historian in residence. Together they brought more then 75 painting students to the region where they experienced the landscape and light of this amazing region. Each fall Hennessey returned to his Baltimore studio with numerous Italian references– recorded on paper and canvas, or stockpiled as memories and ideas in his head. 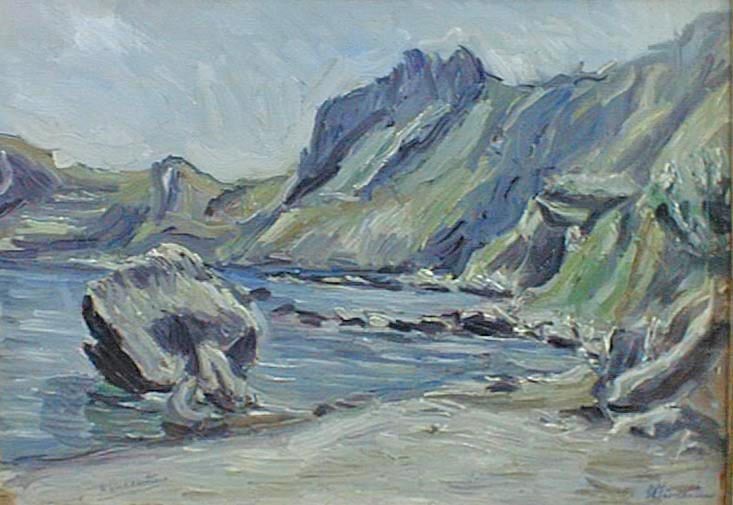 This raft of material was the fodder for winter production, and out of his summer experiences the artist created many paintings and drawings that are either directly referential, or inspired by the area. 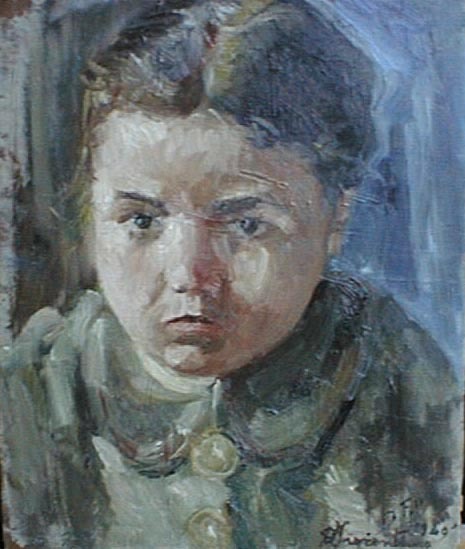 His tendency was to make watercolors, or drawings while in residence in Italy, and then on his return to Maryland the studio production became oil paintings– some large and some small, like the painting above. The subjects range from expansive views out of the hotel window or from perches on the regional hill tops, to more intimate views of familiar locales. 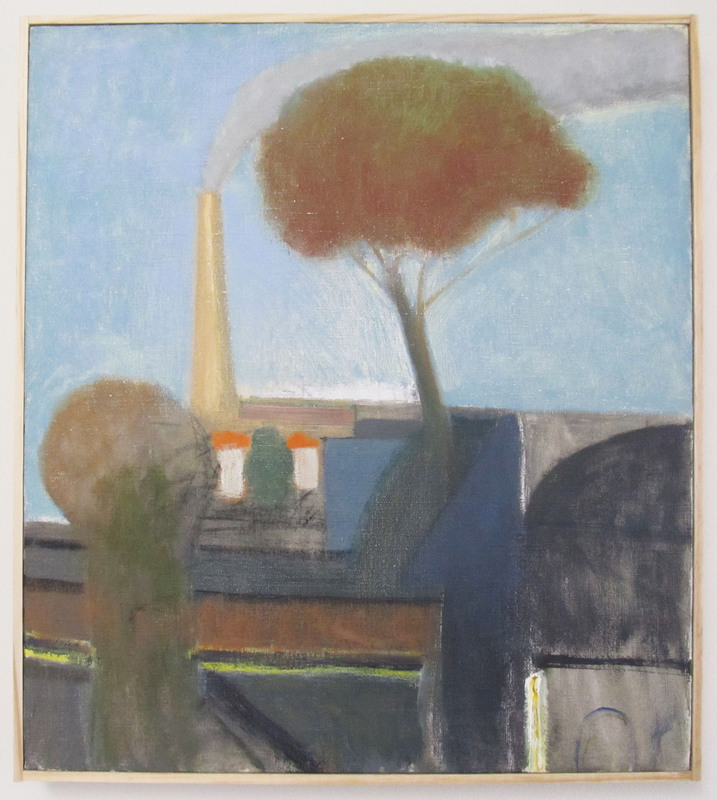 This particular painting is from 1995, and is titled S. Agnello, 24.5″ x 18.5″ the name of the tiny Italian town where Hennessey stayed with his students. The group was always in residence at the Grand Hotel Cocumella, a wonderful, historic hotel that has a long history (since 1777) of hosting artists, writers and other creative people like Goethe, Freud and the Duke of Wellington! The opportunity to spend time in Italy at this amazing locale was the gift of Nino del Papa, a well-known Neapolitan architect who was the proprietor at the time. His interest in supporting artists extended to young American students from the Maryland Institute College of Art, in Baltimore. The Cocumella staff helped create an atmosphere that was supportive of creativity and was welcoming, warm and intimate. 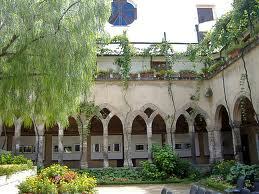 Each year, at the close of the painting program, the City of Sorrento would host an exhibition of the young artists’ work in the City Hall courtyard, or at the nearby Cloisters of S. Francesco. 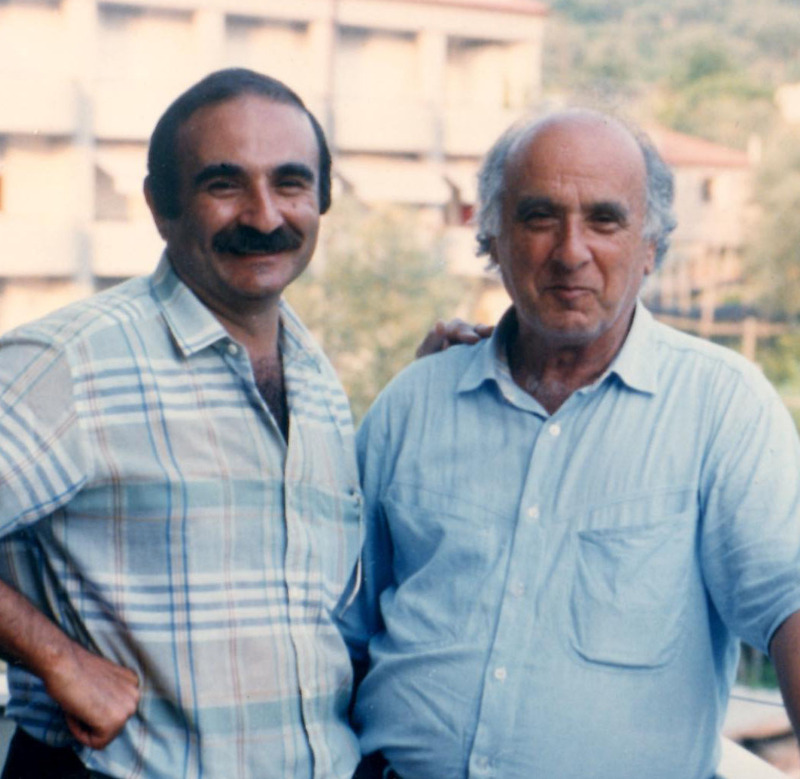 The facilitator of these exhibitions and the person who forged a link between Hennessey’s student groups and the town of Sorrento, was Antonino Fiorentino, a member of the Sorrento City government. Fiorentino’s father, Domenico Fiorentino, was one of the local artists the students met and were fortunate enough to interact with (see past post: Domenico Fiorentino: Influence Reassessed). Hennessey’s paintings that were inspired by his time in Southern Italy always seem to take into account the amazing light of the area. Because the towns of Sorrento and S. Agnello sit on the cliffs above the Bay of Naples, there is often a misty quality to the air, even if the sun is shining. 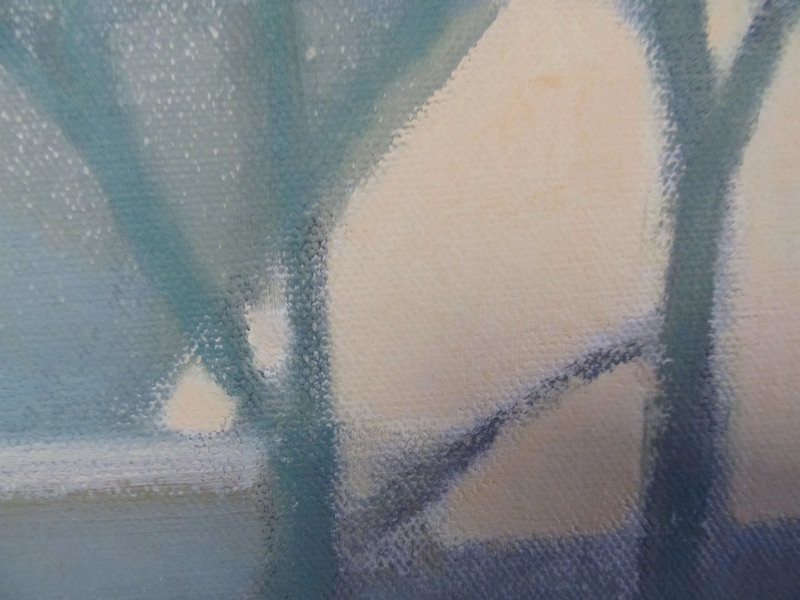 The detail above illustrates how Hennessey took into account this hazy, mysterious light. A one person exhibition by James J. Hennessey, Baltimore, closed a couple of weeks ago on October 28. It was the final exhibit at the Antresian Gallery, a commercial space that attempted to make it in the tough Baltimore art market. Historically, Baltimore has not been supportive of commercial galleries. One can only think of the many that have gone by the wayside in the past 20 years to recognize that this town is not the best place to show artwork. The reasons for this apathy and failure are many and the discussion is much too long for this space. What I’d like to do is showcase some of Jim Hennessey’s paintings, to give you an idea of the work of one significant Baltimore artist. This is also an opportunity to thank the many people who came to Jim’s opening and to recognize those who bought many of his paintings and drawings from the exhibit. If only all Baltimore exhibits were as successful as this one was, we’d see more viable galleries in town! 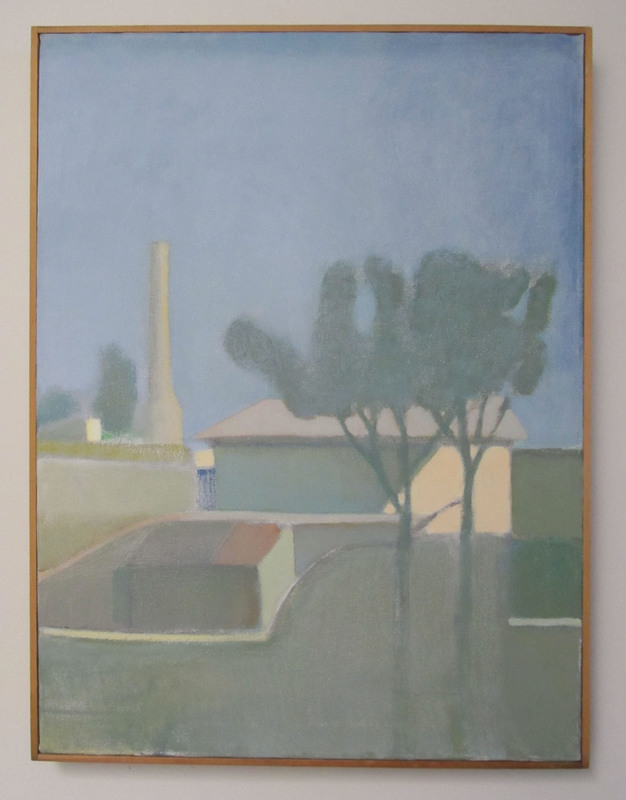 Hennessey’s landscape painting is of the Gianicolo, or in Latin the Janiculum, the second largest hill in Rome, Italy. 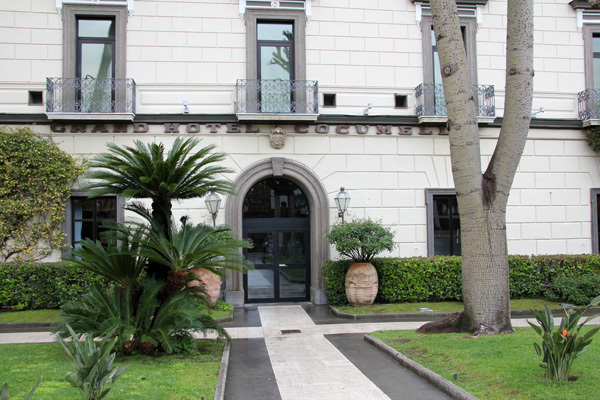 It is also the location of the American Academy in Rome, where Jim was in residence as a Fellow from 1962-1964. The tributes are pouring in to the City of Sorrento and to the family of Domenico Fiorentino, who died on April 4th. Numerous eulogies have also been published in local and Neapolitan newspapers, as well as appearing in online sites. The Italian, realist painter was much-loved by the citizens of Sorrento, well-known throughout Italy, and was cherished by those of us who were fortunate to have met him while visiting the City. institutions and offered to the admiration of future generations. “On this sad occasion, expressing my high appreciation for the work of the artist FIORENTINO, I offer my deepest condolences to you and all your family. “In questa triste circostanza, manifestando tutto il mio apprezzamento per l’attività del Maestro Fiorentino, porgo le più sentite condoglianze a Lei e a tutta la Sua famiglia. “What a sad message to receive. Your friendly, nice and talented father, a real gentleman and artist. I will pray for Domenico and think about him and you all, when the funeral takes place tomorrow on Thursday. It is a great loss for us all. Remember all the nice and wonderfull things you that you have experienced together. We are all happy to have met him and known him. The well-known Italian realist painter, Domenico Fiorentino, of Sorrento, Italy died a few days ago on the 4th of April. What a tremendous loss for the art world–both here and in Italy. The Baltimore artist Jim Hennessey and I have known Domenico since 1992, when we met while directing a summer program in Sorrento for the Maryland Institute, College of Art. We led a small group of American students to Italy in order to paint the lush landscape of the South. I was the program art historian, and my husband Jim was the painter. Domenico Fiorentino was introduced to us by his son, Antonino, an energetic and enthusiastic connoisseur of the arts, who orchestrated our encounters with this amazing artist. Our students met with Domenico in the streets of Sorrento where they set up their French easels to paint the buildings and busy market stalls. On several occasions he joined us on the beach and docks of Massa Lubrense, a small picturesque fishing village where they painted the boats and the rocky landscape. Domenico didn’t speak English and the students’ Italian was rudimentary at best and so during these forays Jim acted as translator. When Antonino–who works as a functionary for the City of Sorrento–had time to join us he spoke with his father about the students’ experiences. After the long days in the sun we all shared drinks at a nearby bar to cool off before our return by local bus to our hotel and studio. It was during these encounters that first summer that a link between Baltimore and Sorrento was forged. It continued and strengthened for several summers, with contact between our young students and the accomplished, Italian master. When we left the MICA program after 5 years, our saddest moment came when we realized that we wouldn’t be able to interact with Domenico the next year, something we had come to expect and treasure at the same time. Domenico Fiorentino was born in 1923, and he spent his life painting his beloved town of Sorrento and the surrounding landscape. He studied early on at the Sorrento College of Art and then in Naples at the Accademia di Belle Arti. He came to the attention of the Neapolitan painter Luigi Crisconio early in his life. Domenico’s family owned the pensione “Rosa Magra,” which attracted artists from around the world. When Crisconio stayed in Sorrento at ” ZI TERESA,” a restaurant and pension in front of the house where Domenico lived, the little boy followed the artist about when he ventured out to paint. Crisconio befriended the boy and later when he was Domenico’s teacher at the Accademia he encouraged this prolific, committed artist. Fiorentino continued to produce his realistic works that included insightful portraits, as well as the documentary landscapes. By the time we met Domenico in the early 1990s, he had become an established member of the Sorrentine Plein Air School of Painting and was best known for his landscapes of the region. We were lucky enough to see many of his early portraits when we were shown a large group of his paintings by a local collector. 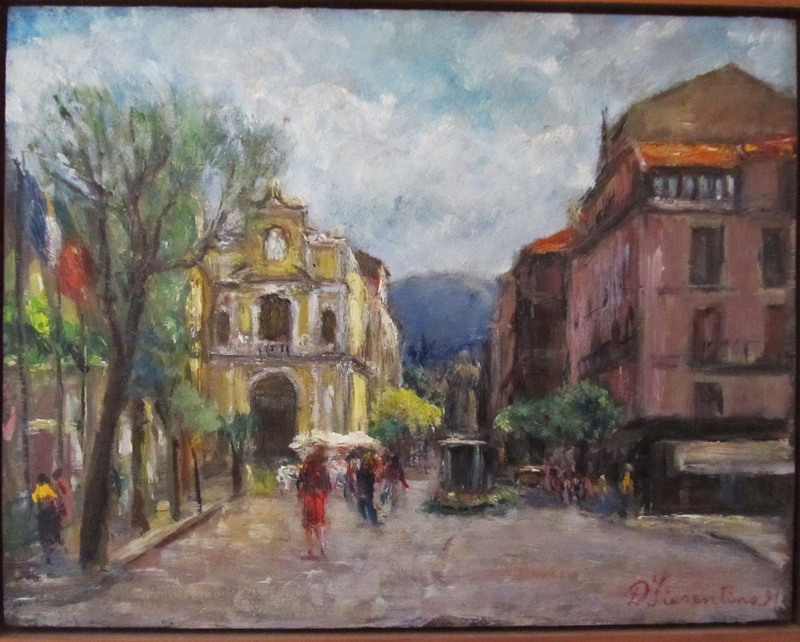 Domenico generously gave us one of his paintings of the town center. When the artist presented us with his gift we promised that we would frame the painting immediately upon our return to Baltimore. It hangs today in our living room with other precious works done by artist friends. The impact that Domenico Fiorentino had on Baltimore and Baltimore artists would be difficult to trace, but I know it was significant. This kind and gentle man, a devoted painter who took out precious time to interact with our young students, met with more than 40 of them through the years. He passed on his knowledge and love of painting and also demonstrated to them his devotion to the arts and his life-long work ethic. He will be sorely missed by many of us. Second installment of James J. Hennessey video.